CORTEX, an international journal devoted to the study of cognition and of the relationship between the nervous system and mental processes, has recently released a special issue titled "The Neuropsychology of Paranormal Experiences and Beliefs." The contents of the issue can be viewed at ScienceDirect.com. Researchers at University of Edinburgh are looking for people who are native english speakers and who have had at least one paranormal experience. You need to be able to come to Edinburgh in order to participate in an Extra-sensory perception (ESP) experiment and to complete questionnaires about your paranormal experiences, personality, and well-being. The whole experiment lasts 45 minutes and you will be paid £5. If you are interested in participating and would like further information about the study, please send an email to espexperiment@gmail.com. A Basic Primer for Paranormal Enthusiasts is now available as a downloadable pdf for ease of printing and sharing. In this primer, we give a brief overview of what parapsychologists have learned so far about temperature in relation to haunting experiences, and provide some useful tips on how to properly collect and interpret temperature readings during field investigations. The primer can be used along with our previous one on magnetic fields (Williams, Ventola, & Wilson, 2007), which it is meant to supplement. Enjoy! When it comes to evaluating parapsychological phenomena, a Catch-22 situation emerges: if fraud or fluke can’t account for the phenomena, then some other theory must be employed. However, mainstream science will not accept psi until it is explained, yet psi is unlikely to be fully explained until it is incorporated into more inclusive scientific problem-solving. Therefore there is a tension between the apparent evidence for psi and lack of a working explanation for the phenomena. In a paper presented at the 51st Annual Convention of the Parapsychological Association, Dr. Hannah Jenkins of the University of Tansmania focused on the explanatory history of psi in an effort to reduce the tension and resolve the Catch-22 situation. 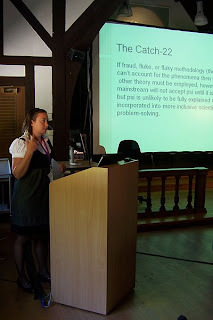 Dr. Jenkins presented two arguments: the first argument is based on an assessment of the publication of prominent psi literature in relation to the dominance of the covering law theory in philosophy of science during the 1940-1960’s. According to the covering law theory, a (general) law of nature is required for any acceptable scientific explanation. However, putative psi phenomena appear to challenge these laws of nature and are only apparent when all other ‘normal’ explanatory avenues have been ruled out. The situation obtained under the covering law theory cuts psi out of consideration, but according to Dr. Jenkins, a re-evaluation can be legitimately called for on the grounds that covering law theory is out-modeded and that newer explanatory models in the philosophy of science since the 1970’s might be more accommodating. The second argument is that the limits of science were formed when a substantially different explanatory scheme was assumed. At the time that the modern world view was founded, psi-like events were placed in the supernatural category of explanation. The scope of science at that time was set to deliberately exclude psi-like phenomena because scientific theory was limited by mechanistic explanations. This background still informs the assessment of psi today. In the current world view, psi is relegated to the unexplainable, paranormal (rather than supernatural) category, but it is still considered beyond the scope of science. Dr. Jenkins’ historical account suggests thatif the body of evidence for psi is legitimate,it ispertinent to look at the limits of scientific explanation in order to discover how best to approach explanation of the phenomena as natural. Jenkins, H. (2008). A Catch-22 : Psi and Explanation. The Parapsychological Association 51st Annual Convention, Proceedings of Presented Papers, August 13-17, 2008, Winchester, pp. 97-110. Schizotypy is a term that indicates a greater disposition toward schizophrenia. Some argue that rather than being associated with psychosis per se, schizotypy is a personality continuum upon which all people vary. In this model, schizotypy is neutral in terms of mental health, but interacts with risk (e.g. stressful events) and protective variables (e.g. supportive social networks), leading to ‘healthy’ or ‘unhealthy’ outcomes, such as creativity or psychosis. Support for this model of schizotypy comes predominantly from research that has found an association between schizotypy or anomaly-proneness and well-being, and also by the high incidence of anomalous experiences among healthy adults. Belief in paranormal phenomena has often been associated with schizotypy, as well as poor critical thinking, suggestibility and psychopathology in the research literature. Other work has found that belief in the paranormal has many dimensions, with some aspects relating to mental health and others relating to psychopathology. A profile has emerged of the “happy schizotype,” who appears to be prone to unusual experiences in the absence of psychopathology and evaluates these experiences as pleasant. Happy schizotypes also have higher levels of mental health and well-being than other schizotypal profiles. 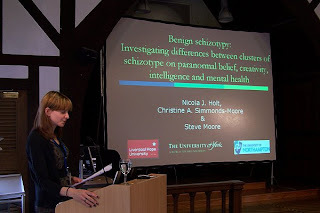 A study presented at the 51st Annual Convention of the Parapsychological Association by Nicola Holt, Christine Simmonds-Moore, and Steve Moore, sought to detail the personality traits that characterize happy schizotypes. 183 participants completed a battery of questionnaires including measures of schizotypy, mental health, belief in the paranormal, creativity, and intelligence. The findings of these researchers supported the notion of a happy schizotype who believes in the paranormal and has subjective paranormal experiences in addition to relatively high well-being. But, further work is required to clearly distinguish the happy schizotype from another profile of paranormal believer associated with low levels of well-being and a schizotypal profile that inludes social withdrawal, impulsive behaviour and cognitive disorganization. Holt and her collaborators also extended previous work by providing evidence for the heightened creativity of happy schizoptypes. No significant differences were found between happy schizotypes and other schizotypal types in intelligence. The researchers suggest that future work should explore what types of anomalous experiences different schizotypes are prone to, and whether these experiences might differ in type or quality. Holt, N. J., Simmonds-Moore, C. A., & Moore, S. L. (2008). Benign schizotypy: Investigating differences between clusters of schizotype on paranormal belief, creativity, intelligence and mental health. The Parapsychological Association 51st Annual Convention, Proceedings of Presented Papers, August 13-17, 2008, Winchester, pp. 82-96. I'd like to welcome Fran Theis in her first contribution to Public Parapsychology. Below is her review of Dr. Marilyn Isabelle Schmidt's book, Remote Viewing: A Theoretical Investigation of the State of the Art. Over the years I've picked up the habit of thumbing through the bibliography of a book to get a sense of where the author may be coming from before giving my attention to the preambles. Dr. Schmidt's bibliography didn't disappoint, and showed her book to be based on scholarly concepts and solid research. I've long thought the academic world needed a book that would present a basic overview of the state of the art, something science-based that could create a foundation for courses of study in the field of Remote Viewing (RV) at the high school as well as university level. Perhaps this is the book. For the practitioner of RV, Remote Viewing: A Theoretical Investigation of the State of the Art not only provides a succinct history of practices leading up to today's acceptance of RV as a useful tool, but is a good overview of where investigation of the human ability to perceive anomalously stands at the moment. It isn't by any means a ‘how-to’ book, but is more like looking under the hood of an airplane to see how the engine might work than learning how to fly it. My second pleasant discovery occurred on page three of the Introduction, where Dr. Schmidt placed her Definitions of Technical Terms and Acronyms. What wonderful common sense to start the reader out with an understanding of the author's sense of the meaning of terms right from the get-go. I’m surely not the only one who has read on in a book, too lazy to thumb to the back for clarification, and realized too late the author and I weren't using common meanings for terms. Unfortunately, I disagree with one of Dr. Schmidt’s term definitions, her definition of remote viewing! Dr. Schmidt defines remote viewing as: “An experimental technique for obtaining information about a site remote to the viewer without ordinary use of the senses...” I object to the word “experimental” because the human capacity for remote viewing has long been shown to exist, starting with Targ and Puthoff's paradigm-changing experiments at the Stanford Research Institute, and as demonstrated in numerous works in her own bibliography, not the least of which is Dean Radin's brilliant meta-analysis, The Conscious Universe. 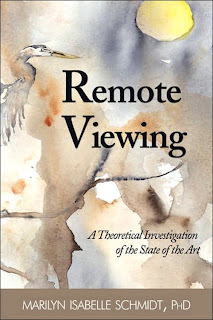 Were I able to rearrange her book, I would have Dr. Schmidt insert her wonderful description of remote viewing in the first paragraph of her concluding remarks, which starts by describing remote viewing as “...an innate ability that all humans have...” (p. 190) into her Definitions section. The dichotomy of her two definitions makes me wonder if she began her research thinking conservatively that remote viewing is unproven, and eventually came to the conclusion that it is a commonly manifested human capability. There is much yet to be discovered about anomalous cognition. In that sense, much experimentation needs to be done in regard to remote viewing, but the capacity for remote viewing itself has been demonstrated to such a thorough extent that anyone who has done her homework, as Dr. Schmidt certainly has, should understand that the capacity has indeed been proven. Serious investigators of the subject of remote viewing will find Remote Viewing to be consistently well annotated. Dr. Schmidt has done a highly professional job of letting out the string so the reader can backtrack to find further information on subjects of interest. One of my personal pet peeves is to find mention of research on a subject without the author having followed up with attribution. This book is one of the better examples of how to properly present serious support for a very important subject. I was saddened to find an omission regarding a historically significant remote viewing done by Pat Price with Russell Targ at SRI. Price’s target response showed two pools of water in a park-like setting that at the time seemed like a target miss. Dr. Schmidt seems unaware that several years after that particular remote viewing was done Russell discovered that Price was indeed accurate, because he had viewed how the site looked many years in the past. To Targ's surprise, the viewing had been a retro-cognition! When the RV was originally done, the investigators had not yet learned to specify the exact year, day and time for targets. Today, a properly trained remote viewer would not make such a mistake. If there are reprints of the book, I hope Dr. Schmidt will consider adding an update and a mention of how important proper targeting through time is to remote viewing. Dr. Schmidt and I are in complete agreement on some of her recommendations for further research. I, too, believe that much can be learned from the subjective process of remote viewing, and envision a day when the study of spontaneous anomalous experience can be given the emphasis that laboratory experimentation has been given to date. Any student serious about knowing the nuts and bolts of remote viewing and who wants a general overview of the state of the art will be served by investing in Dr. Schmidt's scholarly work. She's done the leg work for those who would like to have a sense of the basics of the field, and her bibliography will point the way to more in-depth study of the aspects of remote viewing that individually inspire. Dr. Schmidt tells us the book was originally presented as her doctoral dissertation. I have no doubt she received the highest praise from her committee, and hope she will go on to sell many hundreds of copies to students and teachers who will utilize this substantial contribution to remote viewing literature. The survey of concepts presented here has the potential of providing starting points for student essays and scholarly updates on issues and experimentation for years to come. I, for one, am grateful to Dr. Schmidt for making the effort to do the work to produce such a fine addition to a field about which I am passionate. * Fran Theis, MS, APR, is CEO of Theis Communications, Inc., an international public relations consultancy. Her Master of Science is in Broadcasting Communication from Boston University, and her Bachelor of Arts is in English Literature. She is accredited in public relations by the Public Relations Society of America. Fran has been trained in Controlled Remote Viewing through Stage VI by Paul H. Smith, author of the original military CRV Manual, and Gabrielle Pettingell. Fran is a member of the International Remote Viewing Association, Society for Scientific Exploration, and the Parapsychological Association. Paul H. Smith has submitted the following appeal to drum up support for projects at the International Remote Viewing Assocation. I think he makes a great case for why the support of the general public is essential for research on remote viewing in particular and the field of parapsychology more generally. Outside of philosophy of science circles, few people have ever heard of Imre Lakatos. Lakatos, who died in 1974 at the age of 51, was a peer of Thomas Kuhn, now famous for bringing the word “paradigm” into popular use. Lakatos’s ideas about scientific progress are subtler than Kuhn’s notion of sudden paradigm shifts, but in other ways they harmonize. Kuhn’s revolutionary ideas exposed the role of the “Old Guard” in slowing scientific progress. The Old Guard is the gatekeeper of social and scientific orthodoxy. Its ranks are filled with scientists, academics, scholars, professors, and theorists. Defenders of the status quo, they have committed their careers to a certain way of approaching the world. They are so invested in the old way of doing things that they are obliged to allow only small, acceptable changes to the old paradigm and fight against the new. Thomas Kuhn told us why they do it. Imre Lakatos told us how they do it. Members of the Old Guard don’t just argue against new ideas that conflict or contradict the paradigm they zealously defend. And they don’t just ignore or reject new perspectives, new tools, or new findings that don’t square with the world view they are committed to protecting. They actively resist change by denying to any researcher who fails to win their approval the means to make progress in the field. The Old Guard owns the resources that make research possible. What are these resources? First there are the official publications, the refereed journals, the textbook publishers. If your experiment fits inside the borders of the old paradigm, your findings stand a good chance of being published in journals or books where others can see them and build upon them. What you discover becomes part of the world’s knowledge base. If, however, you research a phenomenon that is deemed inappropriate – that is, for example in the case of ESP or remote viewing, considered ‘pseudoscience’ – it does not matter how carefully you work, nor how profound your discoveries. The Old Guard will spurn you. You will not get published, no one will notice your work, and no one will build on your findings. But that is not the only way the Old Guard keeps the new paradigm at bay. The most powerful means to enforce orthodoxy in science is by controlling the money. Nearly all research requires some level of funding. Whether it is for specialized instruments, data processing, analysis, test tubes, meters, office materials, compensation, or travel – without funding it is difficult to do much worthwhile research. Super-colliders, quantum computing, genetic modification, stem cell research, or even grizzly bear reproduction receives billions, millions, or even scores of thousands of dollars in grants and research funds. There was a time when ESP and other kinds of parapsychology research received not millions, but at least thousands of dollars a year. But as the skeptic movement gained strength, the funds for ESP research dried up. And the skeptical community, along with mainstream science that the skeptics have managed to co-opt, wants to keep it that way. It is time, however, for a change. Thomas Kuhn knew that the Old Guard doesn’t last forever. And Imre Lakatos told us that old “scientific programmes” eventually give way under pressure from the new. Activating the Gabrielle Pettingell Memorial Research Fund. You can make your tax-deductible contribution by mail or online at http://www.irva.org . We welcome any amount from $10 to $10,000 or more. You can be sure that your contributions will used only for worthy research projects. In November a group of six experienced remote viewers will gather and, assisted by four additional research personnel, will to do four sets of double-blind remote viewing targets while being monitored by an operating random event generator (see details). This experiment is being coordinated by consciousness researcher Melvin Morse, MD, IRVA’s secretary John P. Stahler, and IRVA’s president, Paul H. Smith. Expenses will run about $2,000. You can earmark your contributions for this experiment by noting ‘RV/REG experiment’ on your check or online transaction. You may have heard of guerrilla marketing. Now we open a new era of Guerilla Funding. You have a chance to join a movement that aims to overwhelm the Old Guard. Become a part of future history by joining with us today.